$990,000 Big lot perfect to build more units! Nothing better than getting up early in the morning, sitting on the balcony of Casa Tranquila with a coffee and admiring the grandeur of the Pacific Ocean, listening to the waves and the sea breeze while sharing with friends and family just a few steps from the sand. It is one of the best properties of Playas del Coco for sale as it is very versatile. The property is perfect to turn it into a lucrative rental business or turn it into a B & B or small hotel, as it still has enough space to build more units. The house was recently renovated. The wood of the house was treated, bathrooms and floors were remodeled to give a bigger attraction to the main house. 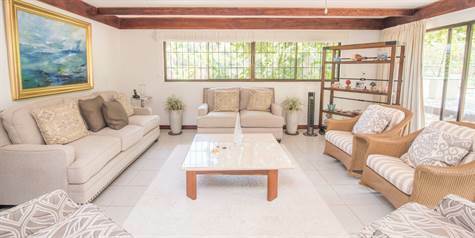 The house is located in the north area of ​​the beach which is having a considerable growth in recent years, and with new commercial establishments settling in the area. Playas del Coco is one of the most touristic and attractive places in Guanacaste. It has all the necessary services to be able to live comfortably but still in contact with nature.